This is a long overdue update to the previous Elan G overview published in late 2016. 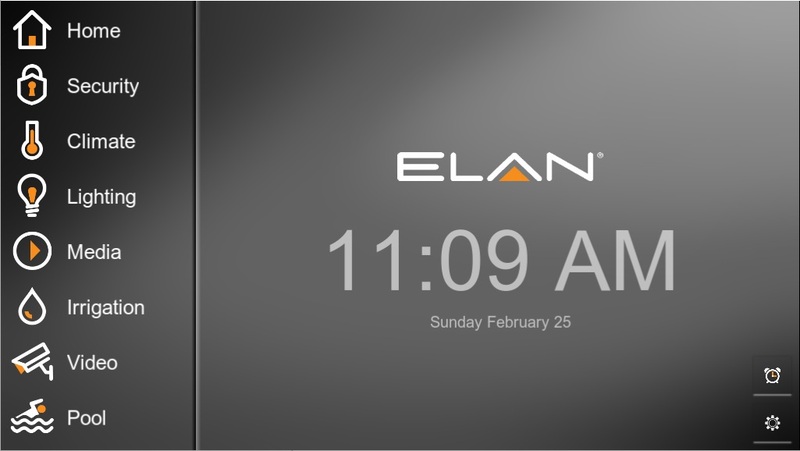 Since then, Elan Home Systems has released the 8.0 core module update, which completely overhauled the user interface and added new feautures such as user editable channel favorites, dynamic zone grouping, and the ability to set alarms. This update can be applied to ALL gSC2, gSC10, and g1 system controllers. Elan Home Systems does not require you to buy new hardware to get the functionality in the new updates. To get this update, see our Elan programming services. This Elan Home Systems review will cover the new features as well as recap all the capabilities of the Elan G home automation system. The screenshots used were taken from my Elan G demo system. You can login to the demo system and play with the it by following these instructions. To specify Elan G in your new build smart home please try our system specification service. The first screenshot is the principal image of this post, and it’s the home screen. This is where you have the ability to select each home subsystem like security, climate, light, etc, and be able to quickly check the status of those systems and even control them. It’s a nice color scheme, but there’s also an option to set an image as a background. The alarm clock icon is where you can set an alarm. Alarms can automatically start scenes at a specific time. 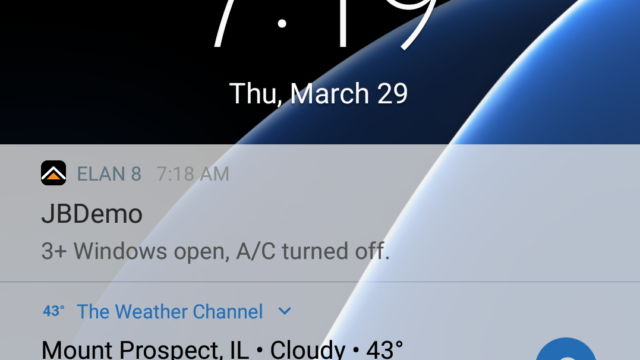 If you’re the kind of person who wakes up at the same time everyday and immediately turns on the news or a radio station, this feature will work great for you. The settings wheel is where you can change setting like doorbell dial plan (to which devices it rings), the volume of the intercom system, and edit channel favorites. The follow sections will follow the system after each subsystem icon is selected. The security tab will offer control and real time status feedback from the home security system, doorlocks, and any door controls. 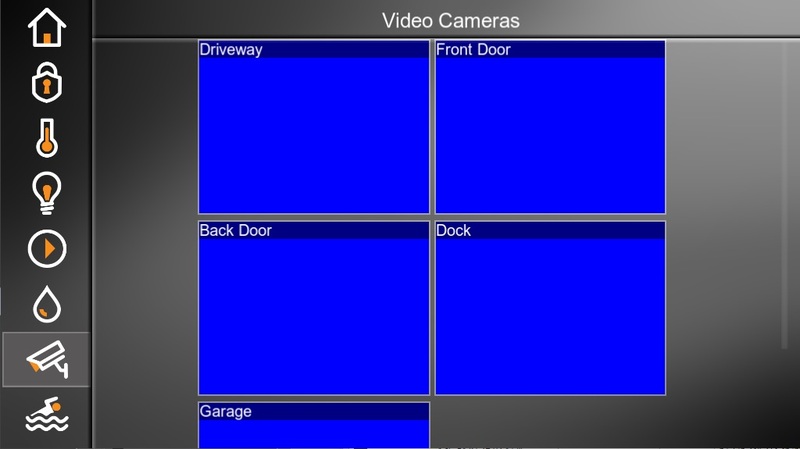 From this screen, we can see that the doors are locked and the garage door is open. 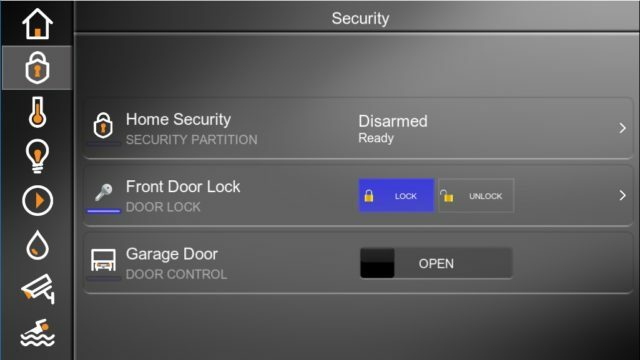 By selecting “unlock,” we can unsecure the front door, and by sliding the garage door control we can close it. After doing so, there will be realtime feedback that the action was complete. Security integration into an Elan G system is in my opinion the most important. It enables a lot of automated events to make the home safer and more responsive in the case of an emergency. For example, I typically program systems so that when the burglar alarm is set off, the lights will turn on turn on to promote awareness, the shades will open to use the windows as a possible escape, the front exterior lights will flash to help emergency responders locate the home, and the front gate will open to allow them to enter. Another quick example of some typical programming is that when the fire alarm is tripped, the climate control system will stop running and all ceiling fans are turned off to prevent prevent fanning the flames (literally!). This is also paired with the same escape and emergency responder assistance automation that were present in the burglar alarm automation. These are just two examples of some very smart automated events. Of course, they are completely customizable during programming, so more or less actions can easily be taken. There are many more examples, which can be seen in the home automation ideas post. The “>” icons on the home security and front door lock tabs indicate that you can drill down further for more information. These icons are ubiquitous throughout the Elan g! home system, and offer deeper control and indication of status. 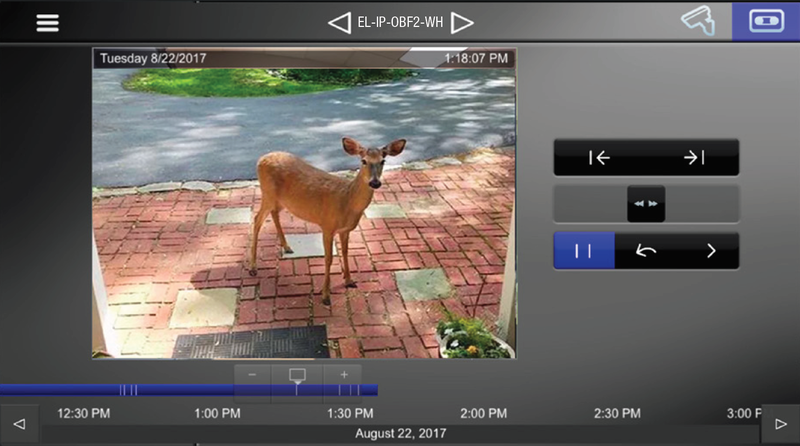 To see more of the security subsystem features including history reports and granular level sensor monitoring, read more about security integration with Elan Home Systems. The climate control tab of the Elan G system will offer status and light control over all available thermostats. There are 3 zones in this example and you can see that each is set in auto change over mode, which means that there is comfort range set with both a heat and cool point. For example, if the tempurature in the bonus room were to drop below 73F it would heat. If it were to rise above 75F it would cool. 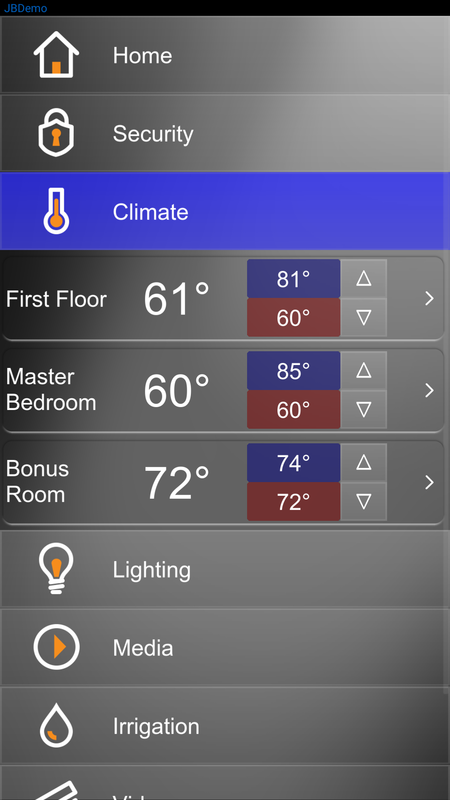 Elan Home Systems just released new thermostats. The Elan EL-TSTAT-8820 and the EL-TSTAT-8810. These thermostats are essential the same as the Aprilaire 8810 and 8810, but with Elan branding and ehanced programming capability through the Elan G interface. 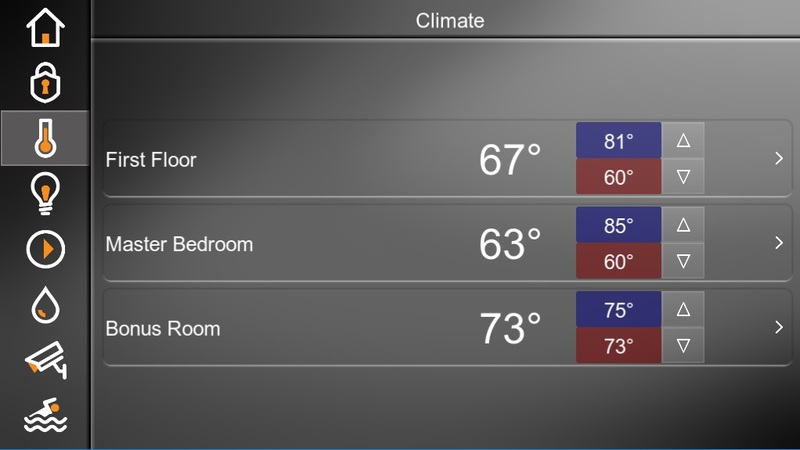 To drill down further into the Elan Home Systems climate control integration and learn how to see tempurature and runtime histories as well as options for humidity control, read more about automated climate control with Elan Home Systems. This demo system is integrated with Lutron RadioRA 2. To specify RA2 in your home see our design service. The Elan G lighting system tab will allow us to see the status of available lighting devices throughout the home. We can see each room and how many switch legs are currently on. You can also see the device scheduler, and which time periods are next to be executed. The lighting scheduler enables you to have lights turn on and off automatically based on clock times or even astronomical clock times like sunrise and sunset. You can also have two different schedules, one for when you’re home and another for when you are away (based off alarm panel status). For example, when you are home you can have the front exterior lighting come on everyday 1 hour after sunset, and then have it turn off again 2 hours before sunrise. The away schedule can be more complex to simulate presence in the home. For example, 1 hour after sunset the exterior lighting could come, 30 minutes later the foyer and living room light could come, then at 11:30pm the interior lights could turn off, and 2 hours before sunset the exterior lights would be turned off as well. During programming, you can also have automation set for your lighting system. For example, if you arm this alarm panel to away all of the lights should be turned off. That way, if you were unaware or didn’t care to check if anything was left on, all of the lights would be turned off anway just because you armed the alarm to away. Simple automated events like this can go a long way towards energy bill reduction and a more eco friendly home. Shades are included as part of the lighting system, and can also be scheduled and automated. 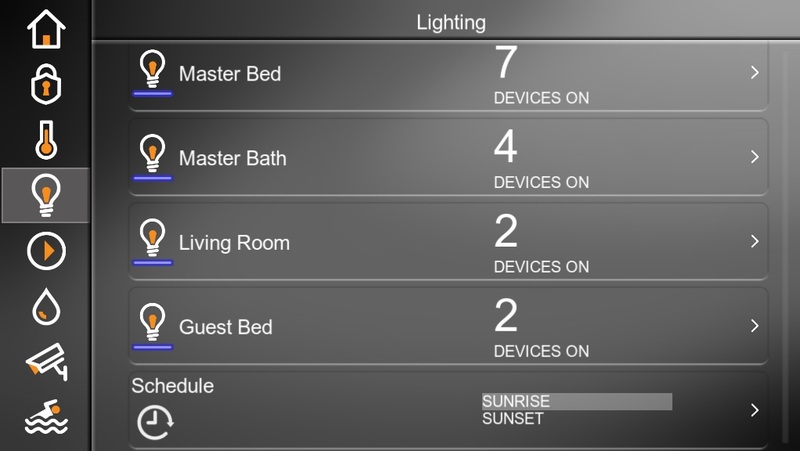 Aside from the automation described above, Elan Home Systems also gives you control of each individual lighting device. The above example is the lighting page for the Master bedroom. There is both status and control of each dimmer. 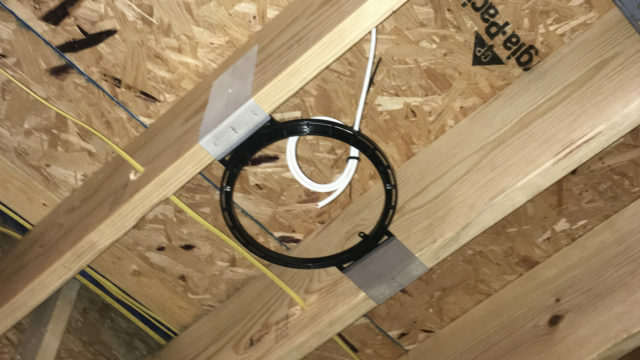 In this home, there is an entirely different page for the master bathroom, but we still have some master bathroom lighting control built into the functionality of this page. From the lit status indication of the “All Master Bath” button we can see that the master bathroom lights are current on (5 switches), but if we toggle this button, all of the master bathroom lights will go off. When does this matter? When you just got into bed and realize that you left some lights on. Similarly, if you select “Master Suite All Off,” the lights in the bedroom, closet, and bathroom will all go off. All lighting system pages are programmed with a high degree of customization. In my programming, I made the green “scene” buttons user editable. This helpful for control, but also for automation. Let’s say that you wanted to set an alarm for the bedroom lights to come on to a certain dimness, enough to wake you up but not enough to be overly bright. 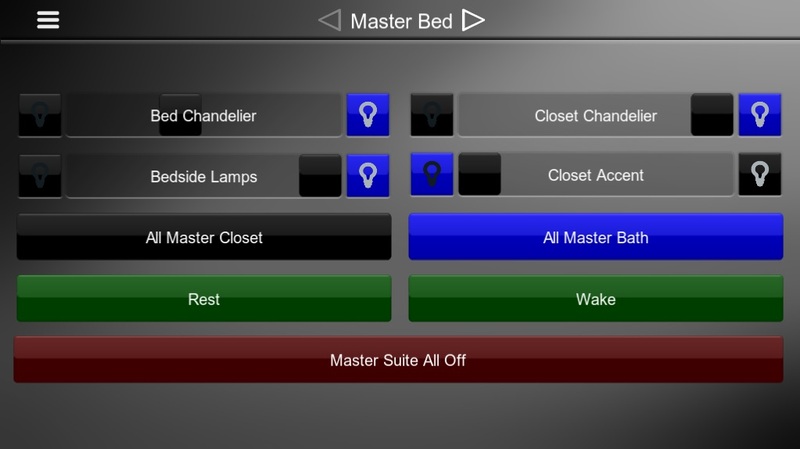 You can set an alarm to set the “Wake” scene, but if you push and hold the “Wake” button in the master bedroom lighting page you will have the ability to edit which lights are coming on and to what brightness. You can even raise the shades as part of this scene. Media control is really what separates Elan Home Systems from their competitors. On this page we can see the status of each room. 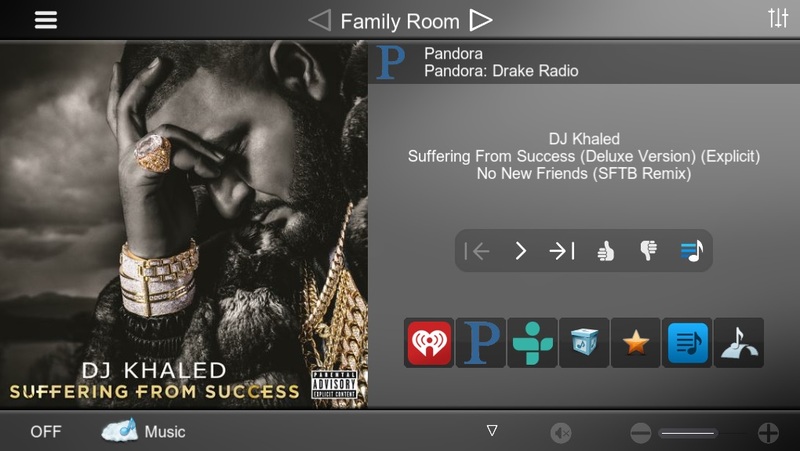 The family room is watching Tivo, and the Kitchen and Patio are both grouped to play Music. Typical to most home automationi system products, Elan G offers one touch TV and Media source selection. For example, if you where to select the mater bed and hit Tivo, the master bedroom surround sound receiver would turn on then turn to the correct input, the tv would turn on and turn to the correct input. 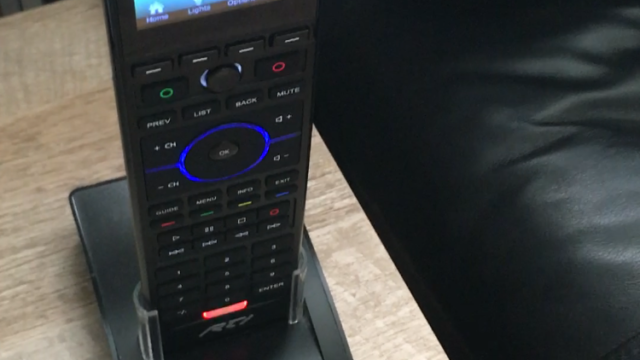 The interface would then offer you control of the Tivo device, turning your interface into a Tivo remote control. However, Elan G is different from other control systems because it puts the zone controller (AV Receiver, HDMI Matrix, Etc) at the heart of the system. All supported Elan G zone controllers offer two-way feedback and the programming drivers constantly listen for confirmation that button pushes were successful, and for changes in status. In most control systems, if the master bedroom surround sound receiver was turned on manually (without using the control system) nothing would happen. In Elan G, if you did the same thing the TV would automatically turn on and the Elan user interfaces and remotes would offer you control of the tivo. This doesn’t have any usefulness to the end user, but it’s a demonstration that the backend is so redundant that it means iron glad control over AV devices. Elan Homes Systems currently offers two remote controls. The Elan EL-HR10 and the gHR200. The gHR200 will soon be replaced by the EL-HR30, which will be Elan Home Systems new flagship model in the Elan G interface, similar to the gHR200 but with more processing power and a larger, higher resolution display. 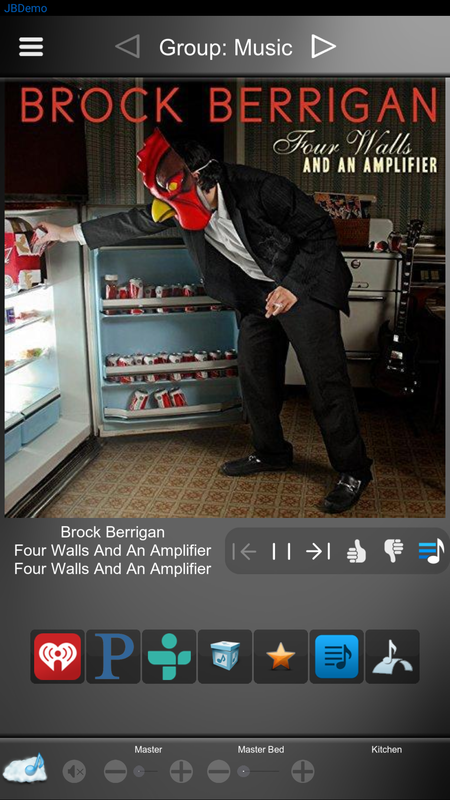 This screenshot is the control offered after “Music” has been selected. The streaming sources available will be heavily dependent on media server being used in the system. In this example I’m using a Mirage Media Server by Autonomic Media Controls. Available through the Elan G interface, I can use Pandora, iHeartRadio, TuneIn, browse my local music, or see my favorites. Not pictured is the ability to play SiriusXM, Deezer, Tidal, Napster, and many more. The Elan G media control is expansive. To learn more about media control, including the ability to group zones and edit channel favorites, read more about audio/video control using Elan Home Systems. Elan Home Systems integrates with several irrigation panels, but the best integration comes from Hunter. 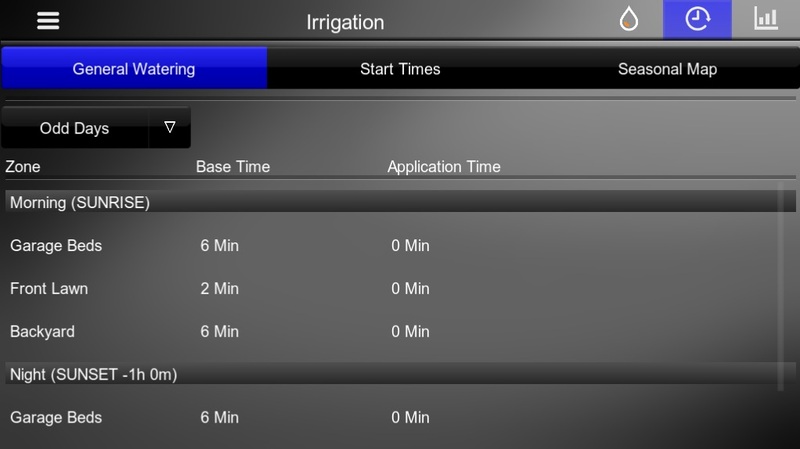 With a Hunter irrigation panel, you can group different individual irrigations zones together. For Example, if you have several beds that are all drip lines they can be grouped into one drip line group called “Garden Bed Drip.” Then each group is set to a particular schedule. The schedule can be for odd/even days, every third day, fourth day, etc. You can select the time on each day that the groups are watered. Instead of setting a clock time, you can set according to sunrise/sunset so that the application time is always ideal. The “seasonal map” tab will allow you to change the application duration depending on time of year. For example, July-September you’ll want this at 100% of the scheduled application time, but when it starts to get cooler you might want to adjust for 70%. This ensures that overwatering does not occur as the weather changes with no necessary input from the user throughout the year. Although there are no cameras connected to the demo system, I still included the page to illustrate what it looks like. You can quickly see each individual camera, and if you select an image it will blow it up to full screen. If you have a PTZ camera (pan, tilt, zoom) the PTZ controls are also availabel through the interface. The Elan G home automation system can integrate with most surveillance cameras that support ONVIF 2.4 Profile S and later. Door station cameras will also be available on this page. If you are using a front door intercom station from Doorbird, Mobotix, or Holovision, the internal cameras will integrate nicely with the Elan G system. I have omitted the “intercom” tab from the demo system, but when using the intercom tab you are able to not only see the front door but communicate with 2-way audio. This year Elan Home Systems has released it’s own line of IP Cameras and NVR’s. 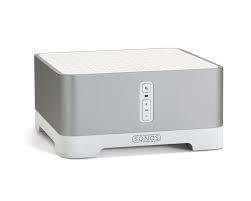 When using Elan Home Systems’ NVR’s, you can also view playback through the Elan G interface. Paired with their cameras that also detect motion, searching playback is easy because it will put a white tick mark on the time bar when there was motion present. The NVR’s still feature web access for setting and retrieval of recordings. When is this useful? Let’s say a neighbor or police officer calls while you’re out of town and says they saw some unusual activity outside your house. You’re all set to respond. You can pull the tapes to check and see what the activity might have been, easily identifiable by the motion tick marks. Let’s say you saw someone you down know lurking outside a window, and were worried that they may have gotten inside. You can call the neighbor back and ask him to inspect. From anywhere, you can unlock the door, disarm the alarm, and when they’re done you can check and make sure that they rearmed and locked the front door. You can even pull a history to see how long they were inside for. Elan Home Systems integrates with Pentair and Jandy pool controllers, but the most dynamic control is available with Pentair. There is nothing you can’t do on the Elan interface that you can do on a Pentair touchpad, which renders the Pentair touchpad obsolete. You can monitor and set heat points for the pool, switch from gas heat to solar, activate the cleaner, spa mode, and even turn on off the jets. When selecting the pool icon on the top right, you are given options to control the pool lights. You can even check the status of the chlorinator to check the water safety. There’s a scheduler as well, where you can schedule pumps and cleaners to run at given periods of time to make sure your pool stays clean while still conserving energy. 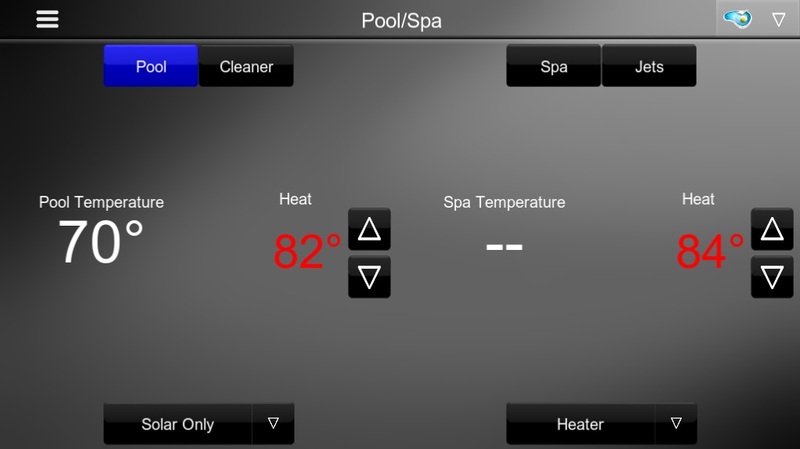 Having remote access to the Spa heat is great because you can make sure it’s heating up well before you even get home. All the screen shots used in this overview were taken using the g!Viewer for Windows. They will look the same on the touchpanels like the gTP7, or the gXP12, and very similar when a large tablet is turned on it’s side. When using the gTP4 touchpanel vertically, or using the Elan 8 app (replaced g!Mobile 7), the interface will become more condensed, but it’s still very good. The Elan G system is very adept as formatting it’s the layout of it’s user interface for the size of the screen it’s given. Thsee images are all screenshots from a Samsung Galaxy S7. and they would appear very similar on an iPhone 6 and later. You can see that all of the options are still available, but they use a slightly different layout to maximize efficiency so that all of the same control capability still exists. The great part about the Elan G user interface is that once you learn how it works on one device you have already learned how it works everywhere. 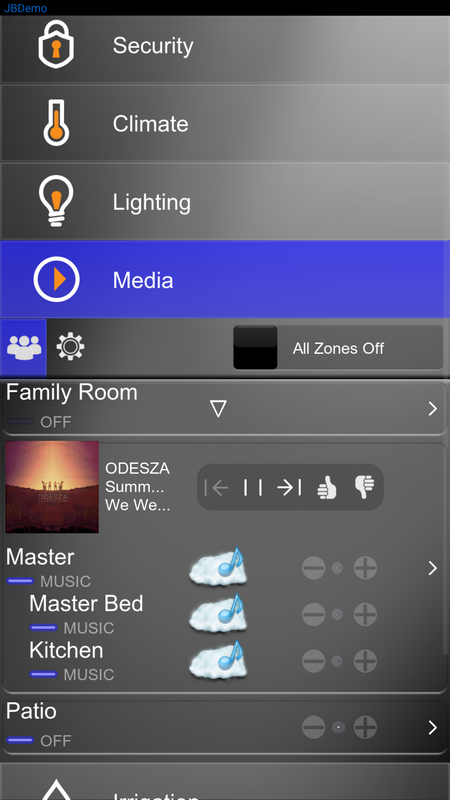 Individual user interfaces can be customized to show certain media zones, certain cameras, light switches, etc, but in a typical install everything is made available to every interface. That’s is for our Elan Home Systems walkthrough. Please let me know if there’s anything that I missed, that you would like to see more of, or anything that you didn’t quite understand.